ALLADDIN had the most liked content! 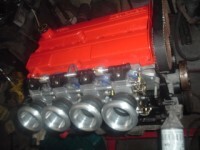 92 sei narrow going zetec v.soon! wont damage seals, should not get inside unless its done wrongly ................ all openings should be sealed. Having not long ago done same I can say that even doing it simple it's hard to keep it all neat. Leaving dash in position and removing scuttle is best where possible, it wasn't on mine. windscreen, side panels, hood,wipers £220 posted ? all g.c. if i was to buy the items playo is selling as a job lot i would be looking to sell the weather gear, pics etc in the advert by playo. does the price inc post interest anyone ? or am i wide of the mark ? its for a narrow car and can include the headlights. Doesn't matter how or where dizzy is as long as rotor points to no1 when cyl 1 tdc on compression stroke. You need to time it, v.brief static - engine to tdc, no1 ink.valve closed , rotor arm points to no1 lead . Then engine running use timing light to fine set at 10 before etc by rotating dizzy. Above assumes it's not a fancy dizzy with built in ecu . alpha can more or less be eliminated, check tps is working and calibrated. if its alpha then its more or less locked (at least to people that may corrupt it ) so can probably be eliminated from issue. has tps been calibrated ? just in case its defunct etc. they are m10 lengths vary but theres plenty of depth on most holes.